When I became a wedding officiant I never expected to officiate bedside weddings. Bedside weddings typically join a couple who have been with each other for a significant period of time and had vague plans to get married but sudden health issues require an immediate marriage ceremony. It is often a very bittersweet experience. Bedside hospital weddings occur in various situations. A bride or groom may be about to have surgery with uncertain results and they want to get married beforehand in case the surgery is unsuccessful. A couple’s health situation may simply require united insurance coverage that can only be achieved through marriage. 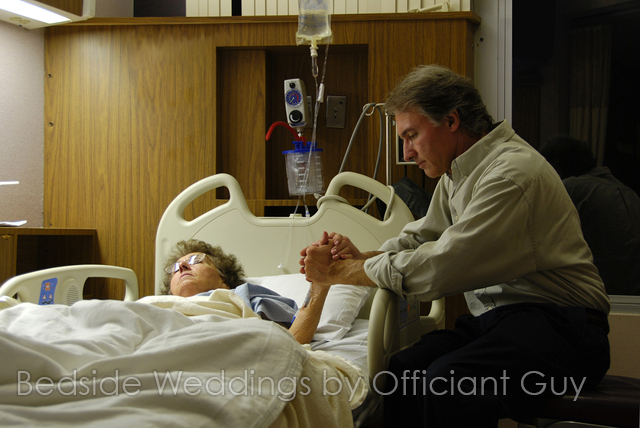 The most poignant hospital weddings are “death bed weddings” before the impending death of one of the spouses. Death bed weddings are very moving and often include extended family members who have their own issues preparing to see a parent, sibling or child die. When I am asked to be a part of a death bed wedding I am charged with being the director, often the comforter, and even the confessor who eases everyone through the emotional process. While death bed weddings are sadly touching, it is especially heartwarming when the bride and groom and their family members treat the wedding ceremony as a celebratory moment in the midst of a very sad time. Tears of joy are much more gratifying than tears of sorrow. A deathbed wedding is a loving tribute that simply has unfortunate timing. 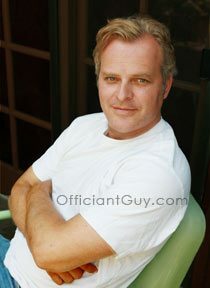 As an authorized notary public and a wedding officiant, I can issue a couple’s marriage license and perform their wedding ceremony only if I truly believe that both spouses understand and agree to all of the legal rights and obligations that are inherent to marriage. When one spouse is hospitalized I ask the attending doctor whether the patient has the necessary mental capacity and alertness to become married. Sadly, I have had to deny my services on a number of occasions. Sometimes one hopeful spouse is unconscious, extremely medicated or simply too overwhelmed by the circumstances to rationally enter into marriage. It is terribly frustrating when I have to deny the weeping pleas of the would-be-spouse perhaps only a few hours before his or her loved one will be passing away. An ill spouse’s medical condition may make it difficult for her or him to communicate. Surgery, serious injury or advanced cancer can make it impossible for someone to speak even though they are conscious, rational and lucid. Other times, tubes down a patient’s throat prevent speaking. In those situations, I have to ask the patient to squeeze my hand twice as an expression of “I do”. Of course, those situations certainly require a doctor’s confirmation that the ill spouse is mentally competent to enter into the marital contract.